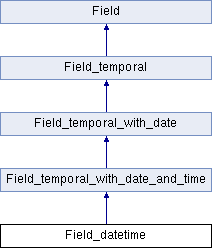 DATETIME columns can be defined as having CURRENT_TIMESTAMP as the default value on inserts or updates. This constructor accepts a unireg_check value to initialize the column default expressions. The implementation of function defaults is heavily entangled with the binary .frm file format. The utype enum is part of the file format specification but is declared a member of the Field class. TIMESTAMP_DN_FIELD - means DATETIME DEFAULT CURRENT_TIMESTAMP. TIMESTAMP_DNUN_FIELD - means DATETIME DEFAULT CURRENT_TIMESTAMP ON UPDATE CURRENT_TIMESTAMP.